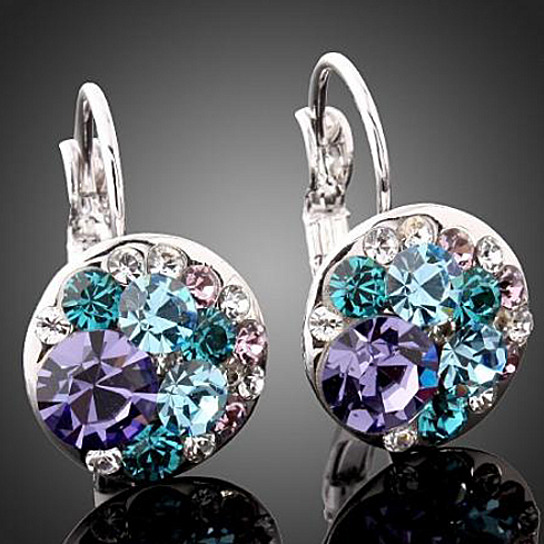 These beautiful Periwinkle Drop Earrings in your choice of 18K White Gold or 18K Italian Rose Gold will turn heads. Perfect for every day wear or a special occasion as soon as you put these earrings on you will simply shine! Highest quality with fully clustered crystals set in White Gold Plated or Rose Gold Plated. Clustered Austrian crystals in shades of blue, pink, white and purple. It has 1" drop. Available in Platinum Plated or 18K Italian Rose Gold Plated. Comes with box ready for gift giving.